Population: Occasionally inhabited by a Polynesian family who comes to collect coconuts. Landscape: Dry, low coral islands. Lots of palm trees and low bushes. Read about diving in Tahanea. Also, check out the newsletter we sent out while we were in Tahanea! (Chris) Well, Tahanea holds a lot of memories for me. The first and foremost is that it was the first place I got to SCUBA dive after receiving my certification. We arrived a few days before my mom's birthday (July 14) and found many other boats. One of them, Bravo Charlie III, offered us three sets of dive gear with full tanks. We dove on my mom's birthday, drifting through the pass over a garden of coral. Clouds of fish surrounded us, and with the current gently carrying us in, we hardly needed to kick at all. It was like flying. 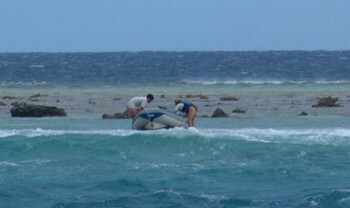 Amanda had chosen not to dive, so she was on the surface in the dinghy, waiting to pick us up. Our problem was that the current was actually carrying us well past the mouth of the pass, and Amanda was using the dinghy's motor to stay at the mouth. When we surfaced, the pass was too far away for Amanda to hear us, and she didn't follow the current. We swam back towards the boats, but there was a slight current from them, and we made very little progress. Eventually, somebody from another boat (Amanda had asked for help) saw our splashes and came to pick us up. Tahanea was also a good place to have fun ashore, as it was almost completely deserted. We had birthday parties for my mom and another cruiser, grilling the rest of our fish from Makemo (there was a lot) over a fire, and doing other fun things. Later, Jack (a boy from another yacht) and I went out to go 'plinking' with his air rifle. Lots of fun shooting at cans, shells, coconuts, and such. Of course, the other memory of Tahanea is how we managed to lose (and thankfully rescue) Tomcat, our hard-to-replace and very necessary motorized dinghy. Fortunately, people from several other yachts helped us out, and we managed to recover it almost completely undamaged! (Sue) I have a lot of good and exiting (too exciting) memories of Tahanea. The birthday SCUBA dive was a wonderful reminder of why I wanted to get certified in the first place, more than 30 years ago. It was also a heads-up that we have to be very vigilant about diving on our own. Swimming on our backs inside the lagoon for an hour while Amanda looked for us elsewhere was not fun. Of course our BC's (buoyancy compensators) kept us well afloat, and Chris and Jon and I were in good swimming shape, so an hour of swimming was not too hard. But the thought of NOT being found before nightfall (less than 2 hours away) was pretty daunting. And worse than that, was the thought of the tide changing to sweep us OUT of the atoll! Well, what an adventure. And a learning experience. 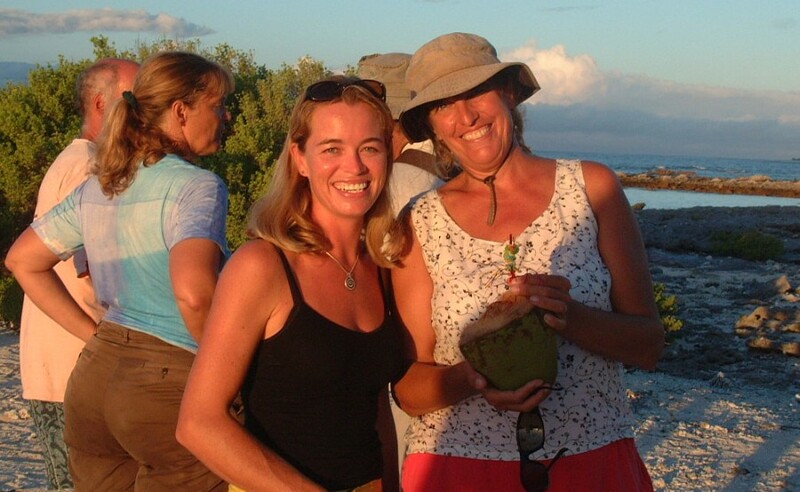 My memory of the birthday party was coconuts filled with rum for Fiona and me, a creative scavenger hunt with quizzes and prizes for the two of us, hermit crab races, Amanda playing the guitar, and a great gathering of friends, both old and young, new and old. (Amanda) Tahanea was the first place we spent a great deal of time ashore with lots of other cruisers. Partially because there were two birthdays while we were there, and partially because the weather was behaving itself... for a while. There was a night when a boat broke its bowsprit, another their chain, and everyone had a rough night. 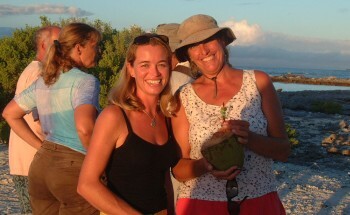 The next morning, we all paraded down to the other side of the atoll, you can be sure. The parties we had on shore were quite fun, though. 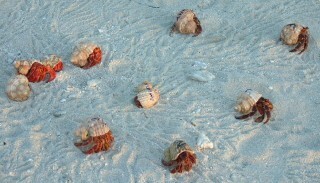 We had treasure hunts, crab races, barbequed fresh fish, music... 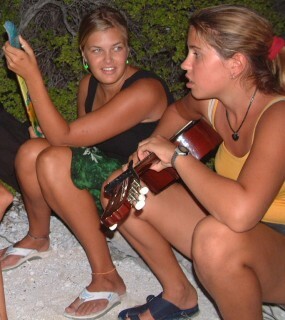 I brought my guitar ashore several times, and Dan on Mariposa brought his, and Sandra jammed on the harmonica, while everyone sang songs around the campfire. Very fun! (Jon) Tahanea was the first atoll we spent much time at, mainly because we caught up with so many friends there: Dale, Liz & Jack on Cowrie Dancer, 2 more teens on Noa af Stockholm, Will & Fiona on Brandamajo, Dan & Sandra on Mariposa, Bravo Charlie, Sisuitl, and others that came and went. Eight boats helped celebrate Sue & Fiona's birthdays. We had many gatherings and potlucks, laughter and scrabble games, birthdays and treasure hunts, shelling and exploring the motus, music and warm sunshine, fishing and snorkeling along deserted stretches of coastline, you get the idea. Some of the more delightful aspects of the cruising life. 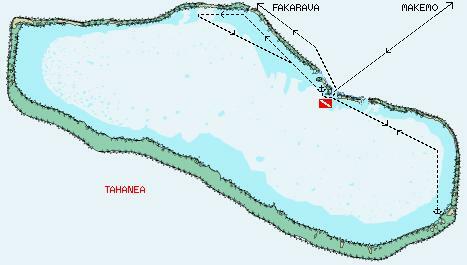 We also explored more of Tahanea than other atolls. This was not entirely by design. When the wind shifted around to the SE after Sue's birthday and our initial anchorage became dangerous and uncomfortable (Noa broke their anchor chain, Sisuitl broke their bowsprit, and we were all on a lee shore). We were the first ones to recover our anchor and leave. This was mainly because Chris spent 45 minutes in the water, directing us how to unwind the chain from all of the coral heads. Then we headed off upwind in search of a more protected anchorage, which we found (predictably) up against the SE corner (lower right on the map) of the atoll. We radioed the others and they soon joined us. Then, when we were about to leave, we sailed back to our original anchorage, so we could get a good jump on our (50 mile) sail to Fakarava. But that night, our ($5,000) dinghy came undone and drifted away, prompting a late-night dinghy search in 25 knot winds and a steep chop. The spray was thick enough that our powerful spotlight wouldn't go very far, so even though I'm sure we passed it, we didn't see it. So the next morning we took Ocelot out to explore the inside of the atoll, looking for our wayward dinghy. We eventually found it, 9 miles away, full of water but essentially undamaged. If you have to lose a dinghy, it's best to lose it inside a completely enclosing reef!